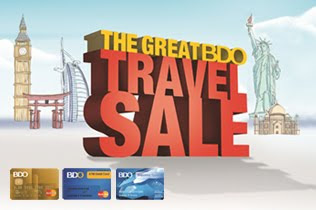 Philippine Airlines Promo 2016: Enjoy the same awesome deals at The Great BDO Travel Sale on domestic destinations ONLINE! Exclusive to BDO credit cardholders. Promo code is first six (6) digits of your BDO card. Fares are valid for one way and combinable for roundtrip travel. Ticket is refundable with a refund fee of Php 1,000 for Premium Economy and Php 1,500 for Budget Economy per sector inclusive of 12% VAT, Change fee of Php 1,000 for Premium Economy and Php 1,500 for Budget Economy per sector inclusive of 12% VAT and fare difference. Ticket is considered No Show if ticket is not reissued /refunded at least 4 hours prior to flight departure or if passenger fails to check-in on time. No Show/Non Users fee of Php 1,000 per sector inclusive of 12%VAT. For tickets that will be reissued at least 4 hours prior to flight departure upgrading to higher fare permitted; reissuance should be equal or higher fare amount. Infant without seat fare is 10% of adult fare. Downgrading to lower fare amount not permitted. With mileage Accrual of 100% for Premium Economy and 50% for Budget Economy. Book and Buy, seats are subject to availability, other travel conditions apply. Mobile device booking now accepts Mastercard and VisaFare is inclusive of 7-kg handcarried baggage. Free baggage allowance is 25-kg for Premium Economy and 10-kg for Budget Economy. Fare is inclusive of 7-kg handcarried baggage. Free baggage allowance is 25-kg for Premium Economy and 10-kg for Budget Economy. Hi, only BDO CREDIT cardholders. H can you send your pal promo in my emai add.. saliligron@gmail.com thank you. how will i book my flight in this promo?